Badger Pass is Yosemite's answer to Sun Valley and St. Moritz. Admittedly, it's not the most glamorous answer, a bit more Marge Simpson than Audrey Hepburn, but it's still handy to have there. Badger Pass is a small hill made up almost entirely up green and blue runs, so if you're jonesing for black diamonds, you'll need to head elsewhere; your closest alternative is China Peak (formerly known as Sierra Summit). Actually, to be absolutely precise, the closest hill is not Sierra Summit but Mammoth Mountain, about 25 miles (40 km) to the southeast. Due to winter road closures, though, Mammoth is a 270-mile (432 km) drive via highway 88, and even if you do drive that route, you'll need fabulous willpower not to stop and strap your skis on at Kirkwood instead. However, since Mammoth Mountain typically stays open until the fourth of July, there's usually a window of a few weeks after the Tioga Road opens when you can get there fairly directly (it's a 90-mile drive from the Tioga entrance to Mammoth). So if you're planning a June Yosemite vacation, you have the option of detouring for a day of very-Spring skiing. But I digress. Badger Pass, while not a destination resort, is inexpensive by ski-resort standards, with a good ski school, and it's an excellent place to learn to ski or board or to indoctrinate a family in the pleasures of snow. It's one of the best places for absolute beginners - the fenced-off area in the center right of the photo is Badger Pass's rope tow area, and it's so close to level that you can walk down it and outstrip anyone attempting to ski it. 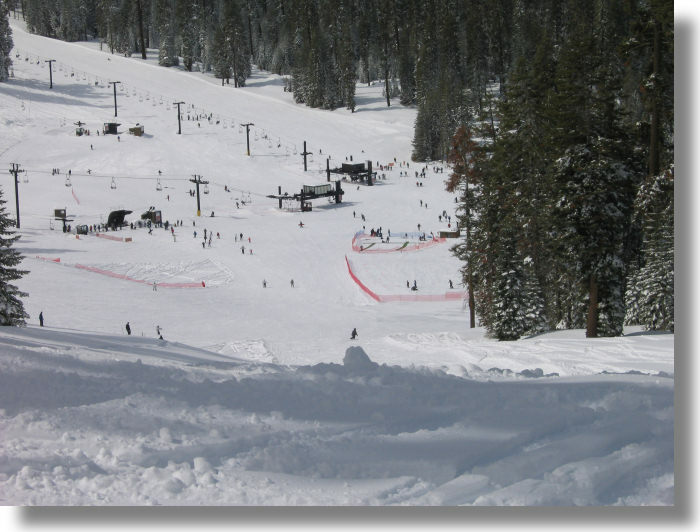 The chair lift at the top of the photo has a grade similar to the rope tow areas at many other ski areas. Badger Pass sits along Glacier Point Road, five miles from the turnoff. The remaining eleven miles (17 km) of the route to Glacier Point are closed to automobiles in winter and become instead a mecca for cross-country skiiers and snowshoers. The snack bar at Glacier Point serves as a lodge in the winter, and cross-country skiiers can spend the night there (you need a reservation for this). If you're a snowshoer, the Mariposa Grove of Giant Sequoias is another excellent winter destination.